You can get caught up in all kinds of data loss scenarios, for example, a sudden careless deletion, an unexpected virus attack, a fearful water damage, etc. Just like Sola, coming to a data loss on iPhone 5 is just a common thing, which can be professionally recovered. Therefore, don't scare yourself; keep your eyes on this post and we will tell you to recover data from iPhone 5 with/without backup via a simple iPhone data recovery program. Dedicated to data recovery, Joyoshare iPhone Data Recovery provides users with thoughtful solutions as possible as it can. With the assistance, you are enabled to retrieve over 20 kinds of iOS data types from iOS gadget directly even when there is no backup; or you can access to your personal iTunes & iCloud backups to extract precious data. What amazing is that not only common but also encrypted iOS data are supported to restore with your own hands. The data can be pictures, videos, contacts, iMessages, call history, reminders, WhatsApp/Kik/Viber attachments, Safari bookmarks, etc. 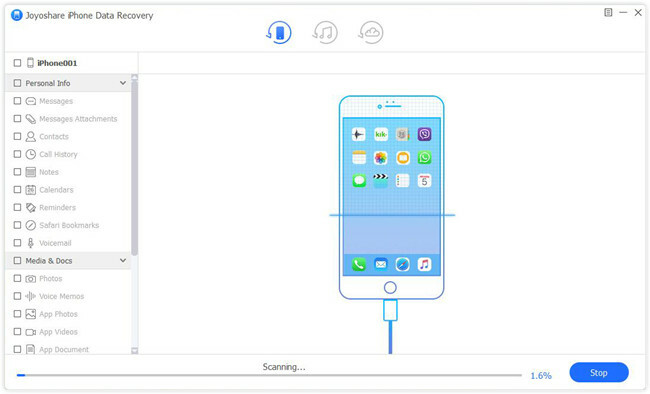 Other than that, Joyoshare iPhone Data Recovery has ability to connect diverse iDevices at the same time, scan files at fast speed, look through recoverable results in real time before recovery and restore data in full or selective manner. It's possible that you get worried when there is no iTunes or iCloud backup you can use to restore valued iPhone 5 data. Just relax now and install Joyoshare iPhone 5 Data Recovery on your computer. Get started to find lost data. After program installation, go to launch Joyoshare iPhone Data Recovery on your computer. Under the "Recover from iDevice" mode, connect iPhone 5 with one original Apple cable. If the computer is not trusted, remember to click "Trust" option on your iPhone's pop-up window. When iPhone 5 is detected and recognized by this program, both device info and supported data type will be displayed clearly. Please go to select desired data types, such as "Call History", "Photos", "Calendar & Reminders", etc., and press the "Scan" button at the right bottom. Once the whole scanning process ends, you are entitled to preview all recoverable contents. Have a quick search or filter out unwanted files if you need to save time. Select important iPhone 5 data and click on the "Recover" button to output them to your computer. As long as you have synced and backed up iPhone 5 data to iTunes and saved them on your computer's local folder, you can use this efficient method below to retrieve deleted iPhone 5 data. Step 1 Run Joyoshare and choose "Recover from iTunes"
Open this iPhone data recovery tool on the desktop. This time you are supposed to set "Recover from iTunes" as your recovery mode. The local iTunes backups can be detected and shown on Joyoshare as a list. Or you can click the "+" icon to add one iTunes backup from designated folder. After that, go to pick up one relevant iTunes backup and tap on the "Setting" icon on its behind to confirm data type. Simply click the "Scan" button to extract iPhone 5 synced data. Having scanned iTunes backups, Joyoshare iPhone Data Recovery will help to classify and present all results in the left column. Go ahead to specific categories to select items and press the "Recover" button to begin retrieval. There is a hope that you have enabled "iCloud Backup" option on iPhone 5 "Settings" and make data backup to iCloud account. In this way, you are allowed to fetch iPhone 5 data from iCloud backups. Keep learning this guide here. Run Joyoshare iPhone Data Recovery, select "Recover from iCloud" mode and continue to log in iCloud account with your own Apple ID and passcode. If you have enabled two-factor authentication, you will be required to input the random code additionally. Similar to iTunes backup recovery, Joyoshare will display all created iCloud backups for you to choose. Download the recent one, select data types and next press the "Recover" button to begin to scan iPhone 5 data from iCloud backup. Wait until Joyoshare completes extracting iCloud backup data. Then have a careful check for all scanned results and get what you want marked. Tap on the "Recover" button to save iPhone 5 data on computer.